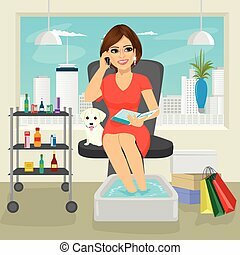 Pedicure female feet spa bowl. 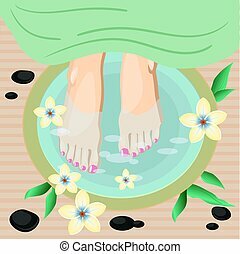 Illustration of female feet on spa bowl with stones and flowers having pedicure treatment. 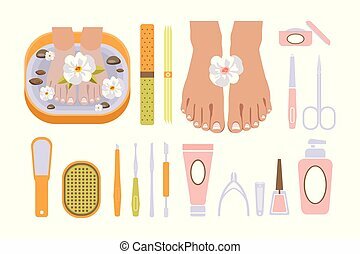 Female feet at spa pedicure procedure. Legs, flowers and ceramic bowl. 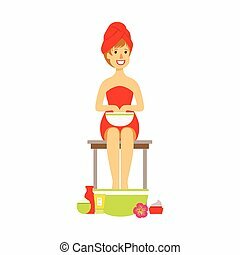 Pedicure set, female feet in spa bowl with flower and tools for a pedicure, beauty and spa salon vector Illustration isolated on a white background.